Weave Magazine: Weave Magazine June Subscription Drive! Weave Magazine June Subscription Drive! 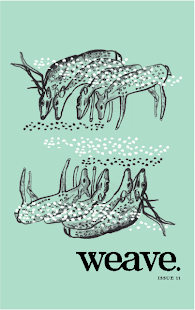 Weave Magazine, as you may know, is an independent literary journal. While we were lucky enough to receive a bit of start up money from the lovely Sprout Fund, that money far from covers the cost of sustaining a long-lasting print journal. Weave Magazine relies on your support. If you've submitted to us, or are considering submitting, or have had work accepted by us and you haven't already picked up a copy of Weave, please support the journal that you would like to see your work published in. We understand that times are tough right now, but your support is the only thing that will, in the long run, keep us going. 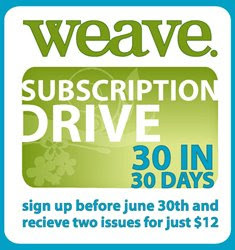 That is why, throughout the month of June, Weave will be holding a subscription drive. Our goal is to get 30 subscriptions in 30 days. We know it won't be an easy goal to reach, but we know you're out there reading and we hope you value the work we do as editors as much as we value your work as writers and artists. Two copies of Weave Magazine! A public thank you on our website - including a link to your blog or website! A warm fuzzy feeling for supporting independent publishing! You can subscribe to either issues 01 & 02 (and get two at once!) or issues 02 & 03. So head on over to our sales page and buy a subscription today! PS: We also lowered the price of a single issue of Weave 01 to $7 - combine that with an 02 & 03 subscription and get three copies of Weave for less than $20 -wow!